Who said kekabs have to be with meat? you can do anything you usually do with meat using vegetables, some vegetables are more adapted to certain cooking methods, but are incredibly versatile. I haven’t used haloumi in a long time, and really felt like grilling cheese, and especially haloumi with its delicate texture and pungent flavor. You can find some other haloumi recipe here and here. I bought some pomegranate molasses at my favorite Greek grocery store (called the Fruit Barn), and had to find a way to use it. Sometimes I can get a little obsessive, when I buy a new ingredient, I won’t stop thinking until I find a recipe to use it. Pomegranate molasses is widely used in Lebanese and Iranian cuisine not really in French or Italian cuisines, but is definitely a Mediterranean ingredient. I loved the pomegranate juices you get in Israel, in those fruit juice joints in any street, they’re so refreshing and healthy. So pomegranate molasses is produced by reducing pomegranate juice, you get some syrupy texture, half sweet, half acidic. Basically the natural sweetness of those kebabs produced by beets and sweet potatoes is a very pleasant sensation for your palate. It’s enhanced by the bitterness of arugula and acidity of pomegranate molasses, so you’ll see how delightful these kebabs are. The stars of this dish are definitely the haloumi and the pomegranate molasses. Start preparing the arugula dipping sauce. Place all ingredients in a food processor and blend, until obtained a paste, but not too thin. Start first by roasting beets. Place cut beets in a sheet, coat them with oil and vinegar, salt and pepper and broil in a 375F oven for about 20 minutes or until just tender. Remove from heat and keep warm. Proceed using the same method with potatoes. Keep warm. 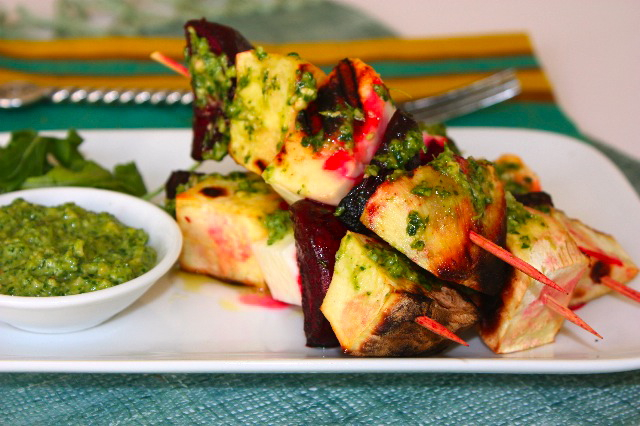 Using a wooden skewer, add one beet cube, then one potato cube, haloumi, another beet, and potato. 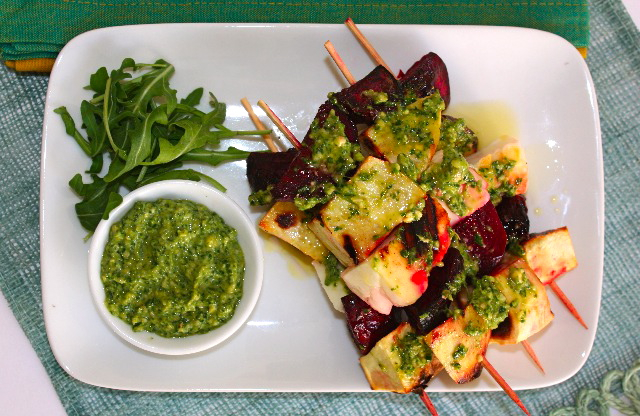 Heat a skillet or a grill pan, and grill each skewer, until the haloumi is grilled on all sides. Add some dipping sauce, and serve hot. You can serve the sauce on the side. This entry was posted by silvia on March 30, 2011 at 3:40 am, and is filed under Appetizers, Salads, Vegetables, Vegetarian - dairy. Follow any responses to this post through RSS 2.0.You can leave a response or trackback from your own site. Simply gorgeous my dear and very much with the feeling of spring! Hope Dad is doing better now and on the mend… take care! 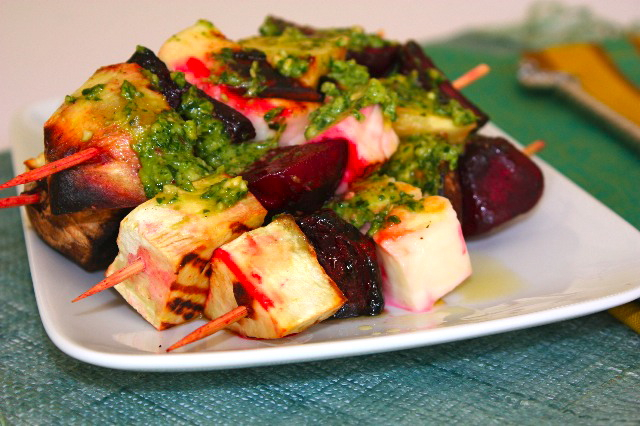 I’ve made lots of veggie kabobs, but never have used beets, sweet potatoes and cheese. Great idea, Silvia. I am busy thinking up recipes to use my new bottle of pomegranate molasses too! I am in awe… I love the combination of the sauce ingredients and your beautiful presentation. I love Halloumi cheese and I have bought it recently to try a salad recipe but this looks tempting too. I love halloumi and I can even find it in my little town. Bonus. Never thought to put it on the grill. I have always pan fried. Sounds great. Ces brochettes sont absolument parfaites! J’aime bien le fait d’utiliser des légumes racines avec le hallouomi… Et cette petite sauce me semble délicieuse! Oh Sylvia, This looks so healthy and delicious. I love the use of beet and especially that arugula sauce! 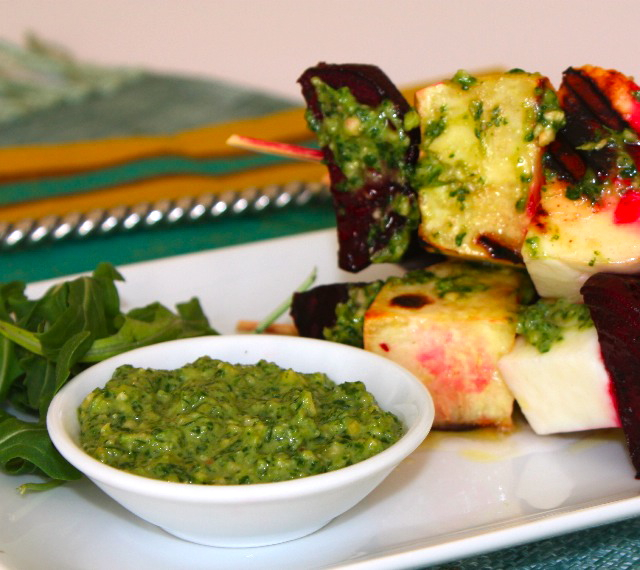 Oooo… vegetarian kebabs! Cool! Silvia, you rock! I bet this tastes super delicious. The sauce sounds really good too. Yummm…. Hope you’re having a great day. p/s welcome back! Is your dad alright? What a fantastic dish – so many wonderful flavors, textures and flavors. Look at those colors! Imagine those flavors! This is making me drool. I would love to get my hands on some pomegranate molasses. Thank you for sharing with me tonight. I’m in the need of some comfort…and you are one of the blogs I know I can turn to. I hope you have a great start to your week. Blessings and love.